HILLSBOROUGH COUNTY, Fla. (WFLA) - In a mere two and a half months on the job, Hillsborough County Sheriff's Office deputy Ellana Oliver has already gotten her fair share of bizarre calls. But this one, probably tops them all. "So when I pull up, I just see the dog's limp body hanging from the car and I don't see his head," Oliver said Tuesday. That's beacuse the dog's head was lodged inside of a Toyota Corolla's grille. The driver hit the terrier mix around E. Fletcher Ave. and N. 22nd St. in Hillsborough County. When the driver got to N. 15th St., she called for help. "I get a message from a dispatcher, saying 'go save that dog,'" Oliver said. 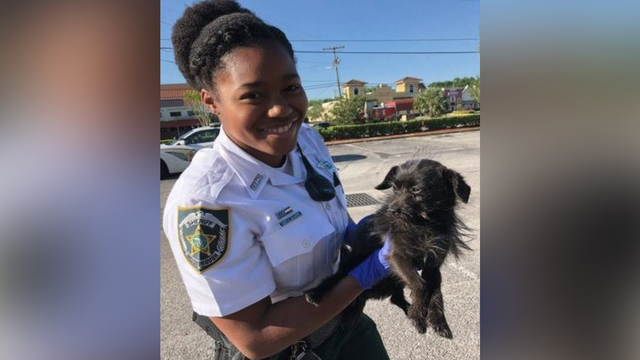 She showed News Channel 8 how she saved the dog. "The man was able to reach down and pull it apart for me," the deputy explained. Oliver, with the help of a good Samaritan, freed the dog. "He just appeared to be scared. That's all. He wasn't whining, he wasn't barking or anything. He was really calm, surprisingly," she said. Oliver and others tried to find the dog's owner, but to no avail. Oliver said the dog was named Dill. An organization in Lee County is raising money to help get the dog's pelvic fractures fixed. For information, go to seniorpawssanctuary.com.